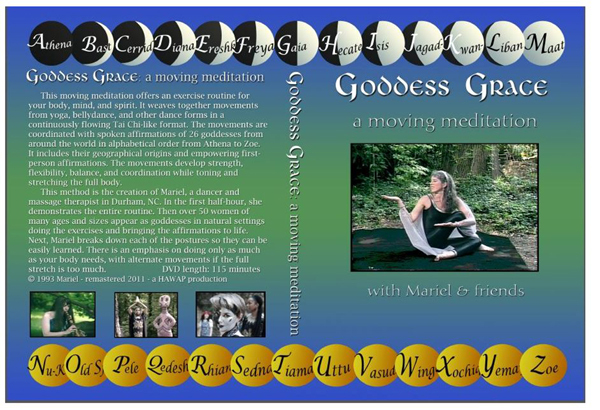 Goddess Grace is a moving meditation which weaves together movements from yoga, bellydance, other dance forms and exercise routines in a continuously flowing Tai Chi-style format. The movements are coordinated with a spoken meditation that invokes 26 goddesses from around the world in alphabetical order from Athena to Zoe. The goddesses’ geographical origins, some imagery associated with them and empowering, first-person affirmations are included. The movements develop strength, flexibility, balance, coordination and grace and can be as relaxing or challenging as desired. The form stretches and tones the entire body while instilling a positive, self-image and inspiring personal and social transformation. In the first half-hour of the videotape, Mariel presents the entire form to music. In the second section, beautiful and surprising images illustrate the Ten Suggestions for Enjoying Goddess Grace which double as guidelines for a more satisfying life. In the next section over 50 goddesses in their natural settings bring the affirmations to life. 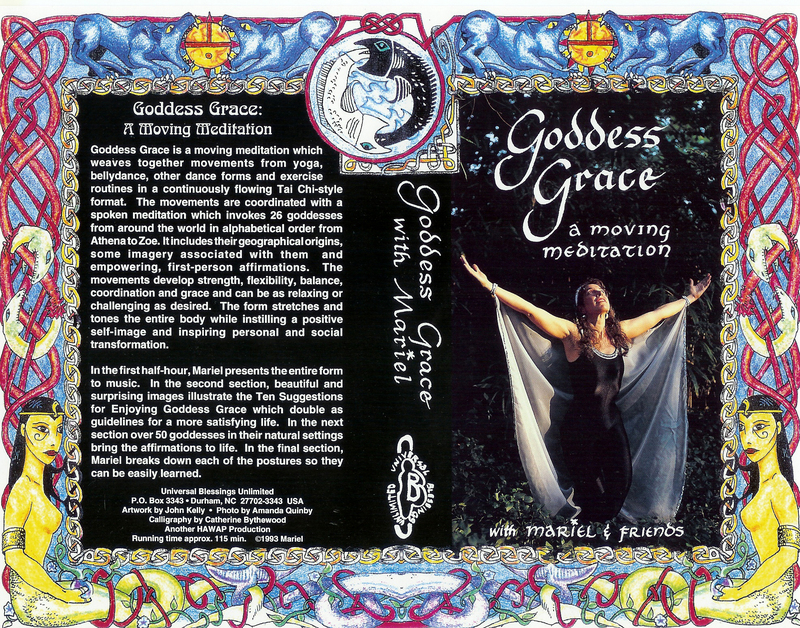 In the final section, Mariel breaks down each of the postures so they can be easily learned, and offers a brief meditation on the gifts of each goddess. Running time is approximately 2 hours. Here is an example of the first section of the video. Here is an example of the instructional segment of the video. You will find more video samples on the Affirmations page. I am the Goddess of a thousand names and infinite capacity... all Her gifts are mine... all Her powers reside in me. It is a splendid presentation of Goddess energy and inspiration. ~ Barbara Walker, author of The Women's encyclopedia of Myths and Secrets and many other feminist works.